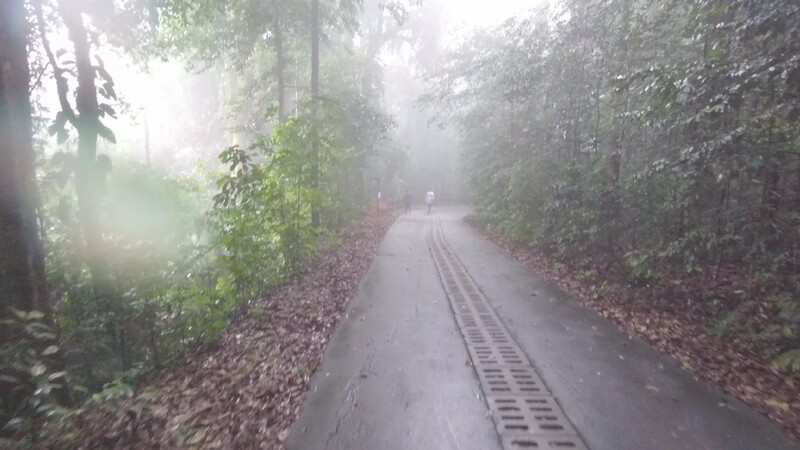 A Misty Bukit Timah Hill | JustRunLah! I wasn’t even suppose to be there. I had a mid-run change of plans to avoid the wide open pipeline trail parallel to Belukar Track when dark clouds raced in. I preferred a little more tree cover in case Zeus decided to go for target practice. So I went around the Dairy Farm trails then the rail corridor, and that’s when the rain fell. This former train passageway feels relatively safer, the trees are closer and seems higher, so I could still continue running. And because, who would want to pass the chance to run in the rain on trail? There weren’t any shelter here anyway. Since I was no longer going to have a proper shower at MacRitchie Reservoir with this reroute, I was glad to have nature wash as much sweat off me while I’m busy running. I have been to Bukit Timah Hill summit only once before. It wasn’t what I had in mind for this weekend run, not even as a second /third option. However, since I was nearing Hindhede Drive, and further down the rail corridor is closed near the old KTMB station, I thought I might as well just take the summit again to make the change of plan worthwhile. I was worried that the path up might be slippery with the rain and more dangerously so going down. I went up anyway, and I was glad I did, because going down was something I had never imagined will ever see in Singapore. Yes, haze. After more than a year…. Joking aside, its was misty at Bukit Timah Hill. The combination of the mist, the rain, and the lush forest made it look like I’m in some very high mountain somewhere else. It wasn’t cold actually, or I was just warm from the run to feel it. The asphalt was not slippery either. In fact, with my Sense Pros, they were very grippy and felt secure, even at that very steep -20% section in the last 300m when I tippy-tapped at high cadence in order not to bust my knees. Is this a regular occurence here? I don’t know. Like said, this was just my 2nd time up it. But I wish I do see this again the next time I climb via another route. If you haven’t been up to Bukit Timah Hill summit yet, and I hope this got you curious, I have bad news for you. They don’t have elevators or escalators to take you up there (yet?). No golf cart service either. However, if you are up for the challenge, if you want to know how is it like going up, how hard you it is, how long, and more importantly, how steep it is, here is the climb with metrics in real time. It’s the first 300 meters that’s the killer. But that doesn’t make the rest of the way any easier. Its a good workout if your knees are game for it. There’s quite a number of people when I was there, even when it’s raining, so I can imagine an even bigger crowd on the more usual touristy times and fair weather. Its better to be there early, especially if you want the chance to encounter the mist.